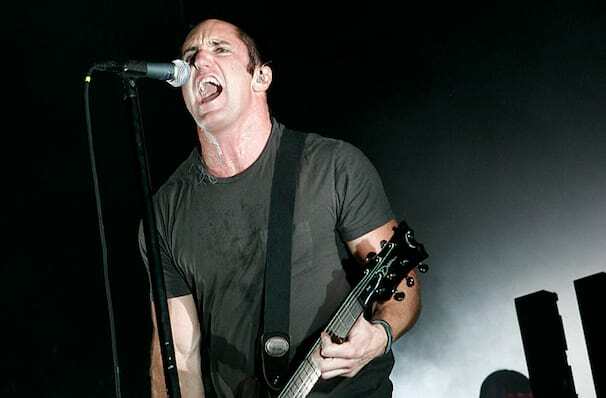 Nine Inch Nails hit the road with latest full length album, Bad Witch! Why See Nine Inch Nails? Cold and Dark and Infinite! The electronic rockers, Nine Inch Nails, are taking their upcoming ninth studio album 'Bad Witch' onto the road in their Cold and Dark and Infinite tour! 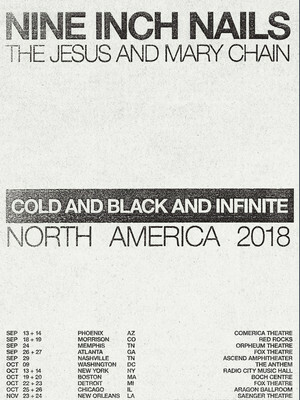 The North American tour features rock band The Jesus and Mary Chain as openers. New album, Bad Witch, is Nine Inch Nails first full length album (six tracks) since 2013s Hesitation Marks, and has been stated as the bands final instalment of a trilogy - following 2016s 'Not The Actual Events' and 2017s 'Add Violence'. Expect to hear tracks 'Ahead of Ourselves', 'Play The Goddamned Part' and 'Over and Out' aswell as some of Nine Inch Nails hits. Sound good to you? Share this page on social media and let your friends know about Nine Inch Nails at The Joint. Please note: The term The Joint and/or Nine Inch Nails as well as all associated graphics, logos, and/or other trademarks, tradenames or copyrights are the property of the The Joint and/or Nine Inch Nails and are used herein for factual descriptive purposes only. We are in no way associated with or authorized by the The Joint and/or Nine Inch Nails and neither that entity nor any of its affiliates have licensed or endorsed us to sell tickets, goods and or services in conjunction with their events.